We gave BSN Syntha-6 Ultra Premium Protein Matrix 4.5 out of 5 stars, so we really like this quality protein powder. It’s great for those looking to build and maintain lean muscle mass because it has 22 grams of protein in each scoop. It uses a protein matrix of a lot of great proteins including whey isolate and concentrate and isolate, calcium caseinate, micellar casein, milk protein, and egg albumen. Whey provides a quick spike in amino acids, while casein gives a slower, steady release of them. It also includes medium chain triglycerides, essential fatty acids, and glutamine peptides. All of these also benefit overall muscle growth and recovery. One of the best parts about this protein is that is tastes absolutely amazing. It literally tastes (and smells) exactly like a peanut butter cookie. Protein powders are so much easier to take when you don’t have to choke them down! You can also take it any time, day or night, which makes it convenient and flexible for your specific needs. It’s a great source of fiber, coming in at 5 grams per scoop, and doesn’t use any aspartame. One of the only downfalls with this protein powder is that it’s not allergy friendly. It contains milk, egg, wheat, peanut, and soy (lecithin). Overall, we think BSN Syntha-6 Ultra Premium Protein Matrix is an above average protein powder and that’s why we gave 4.5 out of 5 stars. BSN Syntha-6 Ultra Premium Protein Matrix is so easy to use. In just a matter of seconds it blends up really quick and nicely. The consistency is fantastic and really thick and smooth. There aren’t any chunks or gritty textures, which is awesome. It says to use 4-5 fl. oz. of cold water or beverage with 1 scoop of protein. I tried this protein powder in the Peanut Butter Cookie flavor. Let me tell you right now, it’s hands down one of the best protein powders I’ve ever tasted! It’s definitely a huge perk of this particular protein powder. It’s so delicious and tastes exactly like a peanut butter cookie. That being said, it’s on the sweeter side, which comes down to personal preference. Even when I just mixed it with water it tasted good but it turned into a heavenly milkshake when I mixed it with unsweetened almond milk. I definitely recommend trying it with your favorite type of milk to make it taste even better. I could probably drink it all day long, it was such a treat. When you open up the lid, it even smells like peanut butter cookies. Breaking down the macros, each serving of protein powder has 22 grams of protein, 6 grams of fat, and 15 grams of carbs. However, if you add in the 5 grams of fiber, it takes the net carbs down to 10 grams. This amount of protein is great if you’re wanting to build and maintain lean muscle mass. There are 200 calories per serving (1 rounded scoop). If you’re watching your weight, maybe just be mindful of the 200 calories per serving and the 6 grams of fat. They are a little higher than average but nothing crazy. It also has 75 grams of cholesterol per serving (about 25% of your daily recommended amount), so be mindful of that if you’re taking multiple servings per day to meet your additional protein needs. Syntha-6 Ultra Premium Protein Matrix has a ton of great inclusions. This protein powder uses a protein matrix including Whey Protein Concentrate, Whey Protein Isolate, Calcium Caseinate, Micellar Casein, Milk Protein Isolate, Egg Albumen and Glutamine Peptides. These are a great, versatile range of proteins. Whey is quickly digested and utilized in the body and causes a rapid spike in amino acid levels. Casein is slower digesting and provides a lower yet steady flow of amino acids that can last up to 7 hours longer than whey. Egg albumen is also a great source of protein and glutamine peptides have a high bioavailability in the body. There are 10 grams of essential amino acids per serving (including BCAAs), which aid in increasing muscle size, strength, and in muscle protein synthesis. It has 5 grams of fiber per serving, which is a nice perk and may help you feel fuller for longer. It also uses medium chain triglycerides and essential fatty acids. This protein powder contains milk, egg, wheat, peanut, and soy (lecithin). So just be careful if you’re allergic or sensitive to any of those. There are zero grams of aspartame, too, but it does use sucralose as the sweetener. I was super happy because I didn’t see any negative side effects when taking BSN Syntha-6 Ultra Premium Protein Matrix. It does have allergens you may need to watch out for, which are milk, egg, wheat, peanut, and soy (lecithin). It also uses sucralose (an artificial sweetener), which may cause bloating or belly pain in some people. After supplementing with this protein powder, we think its best uses are for gaining and maintaining lean muscle. It offers up 22 grams of protein per scoop, which can help build and repair muscle mass. You can also take this protein anytime, day or night, which makes it convenient and flexible for protein packed snacks, meal enhancements, or workout recovery shakes. 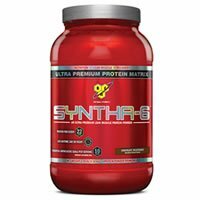 BSN Syntha-6 Ultra Premium Protein Matrix costs $37.99 for a 2.91-pound container. That ends up being 6.16 cents per gram of protein. It ends up being about an average cost for a protein powder, maybe even a little less expensive. When you factor in all the positives of this protein powder, I think you really get your money’s worth and it’s a great value for the price. Unfortunately, I couldn’t find any type of guarantee on the BSN website. I think companies should stand behind their product and offer their customers some sort of security. 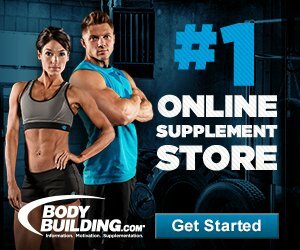 They may accept returns on supplements if you bought the product on gobsn.com or consumer affairs, but there needs to be at least 75% or more of the product left. To buy BSN Syntha-6 Ultra Premium Protein Matrix, click here. Taste Sweet peanut butter cookie flavor, tastes amazing!